Grab this simple workbook that walks you through my step-by-step self exploration process to create your miraculous five-year vision! 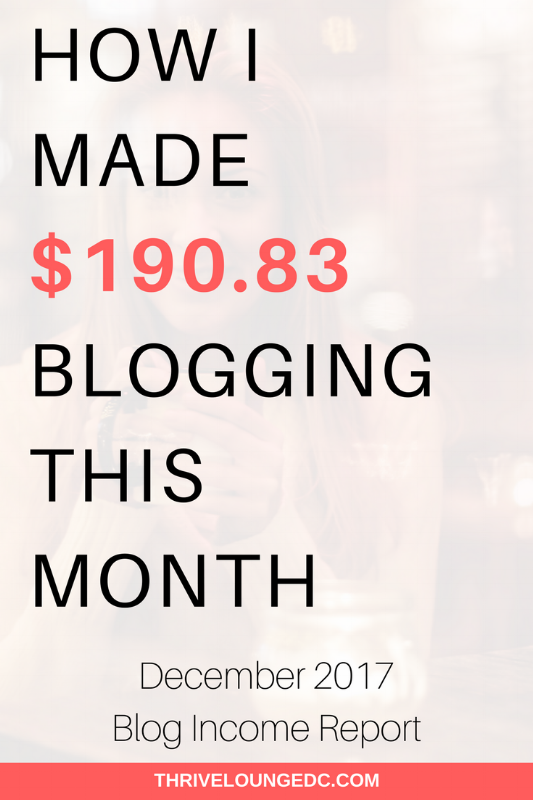 Since we started the blog, we knew that we wanted to keep a monthly report a huge part of the process. Thrive Lounge is all about setting big goals and reaching towards them so from the first blog post we knew that we'd create monthly reports. It would be both a great way to stay consistent with our goal-focused brand and also keep track of how we’re growing our blog over time. Every month we host an event is like drinking water from a fire hose. The entire month, I felt like I was drowning in social media marketing, strategy, coordinating with speakers, sponsors, food and endless emails to my event planner. My brain felt completely underwater and I could only hope that this event was going to be as amazing as it was in my head. So, how did we do on our September goals? Make Visualize Your Victory a huge success! The first step in creating a huge success is to define what success will look like. That way you have a benchmark for whether or not you hit that goal. For this event, the goal was to have a full house of women impecably dressed like the person they want to become in 5 years, great speakers that would inspire women to reach for more in their personal and professional life and create an elite + supportive environment that owuld give women a VIP experience, but still allow them to feel comfortable sharing their stories. On this measure, we definitely accomplished that goal. Women walked in wearing some of the most fab dresses and heels for days looking like they could give A-List celebs a run for their money. (Seriously, women were SLAYING the red carpet - check out the images here.) I learned so much about what people really wanted, whether it was to become an author, reach more women, gain a wider reach for their story, women are making a huge impact on the world around them and had big goals to do more. At the end of the event, we received great feedback in how people loved the intimate conversions and the keynote speaker. The event turned out better than I thought it would've in my head... and I couldn't have been more proud. Event planner: I wanted to work with an event planner because this was my first solo large event and I wanted to make sure I had a professional on my side. In hindsight, I should’ve hired someone just for consultation when I am proving a concept. I had no idea whether this layout for the event was something people would pay for so I started off in a hole before I even got started. Venue fees & Drinks: Well, you need a venue if you’re going to host an event. And you can’t have thirsty guests. Team Gifts: I didn’t intend on spending this, but when a member of your team comes through, you should always show your appreciation. These are concrete #BossRules because #LeadersEatLast (period). Marketing: I tried my hand at some Facebook marketing. Event Signage & Decor: We really wanted to create an elegant experience for guests and the cost in this area was completely necessary. This covered the red carpet, stallions and the gorgeous sign that greeted people on their way in. Ticket Sales: This is self explanatory, but encompasses our super-early-bird, early bird pricing, a few email-only discounts and our regular priced tickets. Sponsorships: We had several sponsors that helped to cover food costs or provide giveaways to attendees. Yes, you totally read that right. This month, I’m sharing how I worked over 100 hours to put an event together, created a banging marketing plan, got together amazing speakers and hosted a fab event - and paid money to do it. My friends and I always talk about how down right annoying it is when you see a packed event or when you see someone with millions of followers they never talk about how they got there and definitely don't share the numbers behind it. I want to start the trend in being totally clear about my wins and fails. So, You've Created A Vision Board, Now What? Now that we've been working on the site for almost a year (and tracking our progress the entire time), it's easy to see the clear winner in where our site traffic is coming from. Even though I have a Master's in Analytics, you don't really need it to see that Pinterest is straight dominating our other social media platforms! The best thing about it is that we don't have to invest a ton of time into marketing on Pinterest to get this traffic! A few months ago, we decided to stop working on our other social media accounts all together, only using Facebook, Twitter and Instagram for connecting with people, but doing the majority of our social media activity on Pinterest. In April 2017, we made the switch from Mailchimp to ConvertKit for our email service and this completely skyrocketed our email list. Convertkit makes it incredibly easy to send freebies to your audience and create automations like the one I use for the 5-day vision challenge. On top of that, the web forms are completely customizable so it matches the rest of my site. I place a popup form and another form at the bottom of the page to give away a freebie that is an add-on to the content. This makes it easy for people that enjoy my content to get an upgrade and it helps me easily keep in contact with them over time. We expected our email list growth to slow a bit in September because we were focused on sending traffic to the ticket sales landing page instead of creating a lot of new blog content. Another huge contributor to our email list growth has been our two meetup groups, located in Washington, DC. We host two meetup groups that service content creators, My IG is LIT and District Content Creator Collective. These groups allow up to connect with our target audience on a personal level to understand what their goals are - this gives us the insider scoop to be able to product things and create content that best fits their needs. This month, we saw a nice bump in followers on Instagram because of the event. With all of the DC local influencers showing up and being highly engaged on social media, we had a large group of people follow us on the day of the event and afterwards as people started sharing their fab rooftop pics. Quite simply, I learned to follow my crazy ideas. While I didn’t break even on this event, I was able to build better relationships with some of the influencers in the city and connect one-on-one with some of the people that I only chat with online. This is invaluable in-person connection and learning. (Meeting with all of those people one on one for dinner would’ve cost me much more than 100 bucks!) I also created new fans and followers for the brand. Most important for my growth, I learned that this type of event is something that people will pay for (aka. I validated the concept) and got some great feedback on how to create it differently in the future. You can only get these things when you venture to try something new. Oh August! After our mid-year brunch last month, I felt incredibly inspired to get back to basics and create experiences that would allow women to come together to share ideas and goals. Every time I spend time with my #ThriveSquad, I leave feeling ready to create the next BIG THING. So, how did we do on our August goals? Blogger Week is an annual conference held in Washington, DC that helps new and experienced bloggers learn how to create, market, grow and monetize their blogs. I was selected to give a talk at Blogger Week about how to create a Big, Hairy, Audacious Vision for your blog. The purpose of my session was to help bloggers thing bigger about the impact they would make with their blog. Rather than thinking of your blog as a fun little project, I encouraged people to think about their blog in terms of the impact they will have on people and how that tied to their personal mission and vision. I got really vulnerable with attendees, I told them my stories of failure, poverty and hunger (like no food on the table kinda hunger) and how that experience drives me to be there for others who may be suffering in that way. Because of my story, I feel pulled to help people work towards their vision. The talk was incredibly successful as I got attendees chatting with the people around them and sharing their story in small groups. At one moment, people started sharing their experiences with weight loss, homelessness and abuse - and how that empowers them to build something to help others. That was the moment I knew I accomplished my goal. I had the idea for a fabulous rooftop event where attendees envisioned themselves 5 years from now having accomplished your 5-year goals. Attendees would be encouraged to introduce themselves as a NY Times Bestselling authors or successful millionaire entrepreneurs. This month, my goal was to get the marketing together for this event including social media images, quotes and digital flyers for all the speakers. If you follow us on Instagram, you'll know I crushed that goal! Finding speakers for an upcoming event can be somewhat of a struggle if you don't plan on doing a call for speakers, especially since we all know the speakers can make or break an event. I am always nervous when I pitch speakers to be apart of an event because, like most people, I don't like rejection (However, I am noticing the more pitching I do, the less affected I am by rejection. It's slowly becoming this thing that just happens when you put yourself out there over and over again.) The speaker list and activities grew slowly as I researched and reached out to each speaker individually. However, by the end of the month, I was incredibly proud of the list of speakers, which included many women that I looked up to and hoped to collaborate with. Now that we've been working on the site for almost a year (and tracking our progress the entire time), it's easy to see the clear winner in where our site traffic is coming from. Even though I have a Master's in Analytics, you don't really need it to see that Pinterest is where the vast majority of our new traffic is coming from! This month, we decided to stop working on our other social media accounts all together, only using Facebook, Twitter and Instagram for connecting with people, but doing the majority of our social media activity on Pinterest. This month, we saw a nice bump in social media following from speaking at the Blogger Week conference. When you have a great talk and inspire others to follow their dreams, they are happy to follow you on social and keep up with you to see what else you have going on long after the event. Every tiny step you take contributes to your brand as a whole and each interaction you have with others is an opportunity to share your vision for your future and to help someone discover theirs. Speaking at Blogger Week was an unpaid opportunity, but it gave me an opportunity to take what I normally share in blog posts and bring it to life in person in front of a brand new audience. Many of those women joined my email list and followed me on social media others bought tickets to Visualize Your Victory and everyone (I hope) benefited from my talk - which was my biggest goal for this month. Overall, I learned one thing - Don't take your opportunities to make a difference lightly. Take it seriously, practice out loud, on paper and in the mirror, record yourself and listen to the recording over and over until you it's just right. For some, you'll only get one opportunity to make a life-changing difference. Make sure you do it right.